Happy birthday to me! Today is my 23 birthday, which also means that I’m starting my second year of real adult life (I miss college!). So, I’ll admit, it was well over a week before my birthday when I made these, but my best friend and fellow July-baby Charlotte and I are firm believers in celebrating our birthdays at least four times per summer. One down, three more to go! My friend Leah brought my attention to the concept of putting balls of cookie dough into cupcakes, and I knew I had to make these my own. And, being the amazingly decadent treat that they are, I knew I was going to go all out. 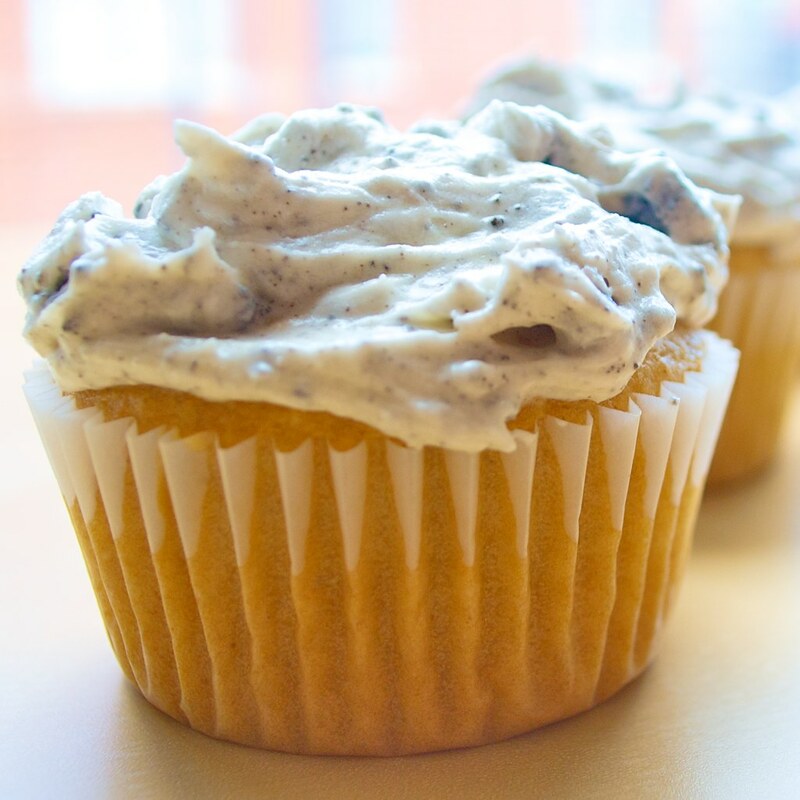 I cut back the sugar in the cookie dough and made it very chocolaty to balance out the sweetness of the cookies-and-cream frosting and the rich vanilla flavor of the cupcake batter. I will fully admit here that I taste-tested the creation every step along the way. Yum. Oh and I shared these with my sister Sindha when she was visiting. 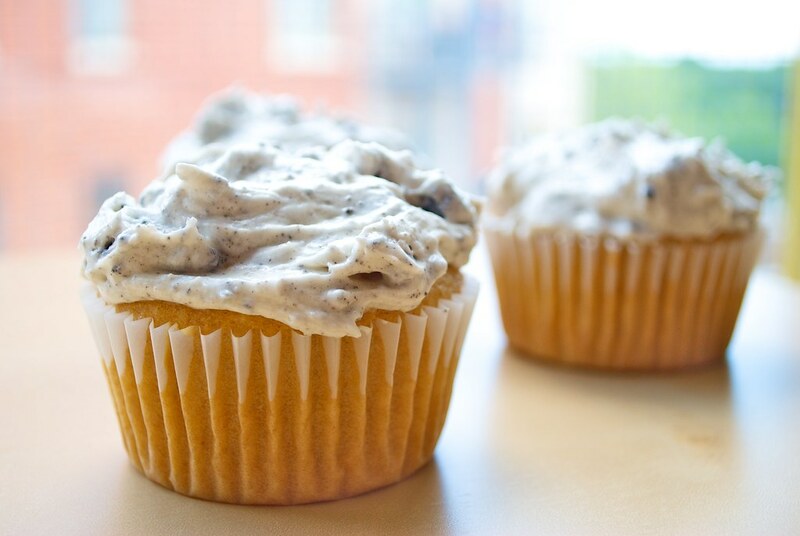 The lucky girl–she got to eat pasta alfredo, sun-dried tomato quiche, AND vanilla cupcakes filled with double chocolate cookie dough topped with a cookies-and-cream frosting. Did I hear her complain? Nope. Is she going to be visiting me again? Definitely. Now then, here is the best birthday treat a girl could ask for! 2. Add the vanilla extract and milk and beat for an additional 2 minutes. 3. Mix the flours, cocoa powder, baking powder and salt in a separate bowl. 4. Slowly add the flour to the beaten wet ingredients. Beat on the lowest setting until flour is mixed in. 6. Using a scant tablespoon, roll dough into balls. I made 27 cookie dough balls. Smaller is better here as they need to go into a cupcake! Place cookie dough balls in freezer safe container, and place in freezer for at least one hour. Feel free to make this a day or two in advance though! Note: This makes double the cookie dough balls that you need for the recipe. You can either double the cake batter and have 24 cupcakes, or you could combine two cookie dough balls together (not frozen) and bake them into cookies (350 ºF, 12-15 minutes). 1. Preheat oven to 350 ºF. Line muffin pan with cupcake liners. 2. In a measuring cup drop the tsp of vinegar in the soy milk. Set aside to curdle for 5-10 minutes. 3. In a large bowl, beat together the curdled soy milk, oil, sugar, vanilla for 2 minutes. 4. In a separate bowl mix the flour, cornstarch, baking powder, baking soda, and salt. 5. Slowly mix the dry ingredients into the wet until no large clumps remain. 6. Fill cupcake liners 2/3 of the way full (scant 2/3 to make 12 cupcakes!). 7. Place into preheated oven for 5-7 minutes. 8. Remove from oven and pop the frozen cookie dough balls into the partially cooked cupcakes. Press them in if needed and try to cover the tops with the soft cakey batter. 9. Put back in oven, and bake an additional 17-20 minutes until fully risen and the tops are golden. 1. Beat shortening and earth balance until fluffy, about 2 minutes. 2. Add powdered sugar, and beat an additional 3 minutes. 3. Add vanilla and soy milk and beat 5-7 minutes until fluffy. 4. Crush cookies (5 cookies ~ 1/3 cup) in a bag, and mix them into frosting. This entry was posted in dessert and tagged birthday, chocolate, cookie dough, cookies-and-cream, cupcake, food, recipe, vanilla, vegan. Bookmark the permalink. These look so yummy. Happy birthday! That’s insane! It sounds like a delicious cupcake, I think that the textures would probably be lovely to eat together. Ooh, I love cookie dough and cookies & cream. Would it be too much for me to re-create this recipe in an ice cream cone? You know, for a cupcake that looks like ice cream! Happy birthdays to Eva and Charlotte! Thanks Justine! And yeah, that be awesome, but I’m not sure how you’d bake the cupcake in a cone without the cone burning or completely drying out.. Maybe you could just transfer it to a cone afterwards for display? Like one of those big waffle cones. Now I’m having serious cravings for ice cream cake! P.S. The cake gets baked in the ice cream cone instead of in a paper cup. 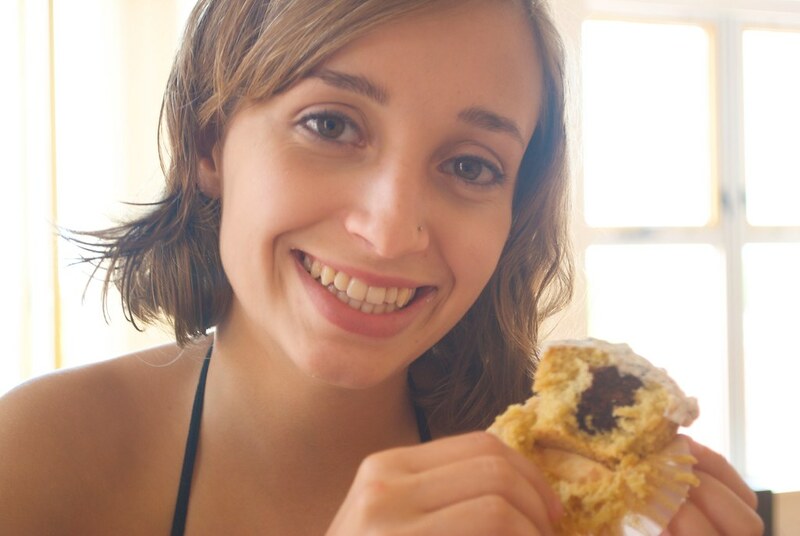 I have tried these firsthand from Eva the vegancupcake queen herself and they are ridic. 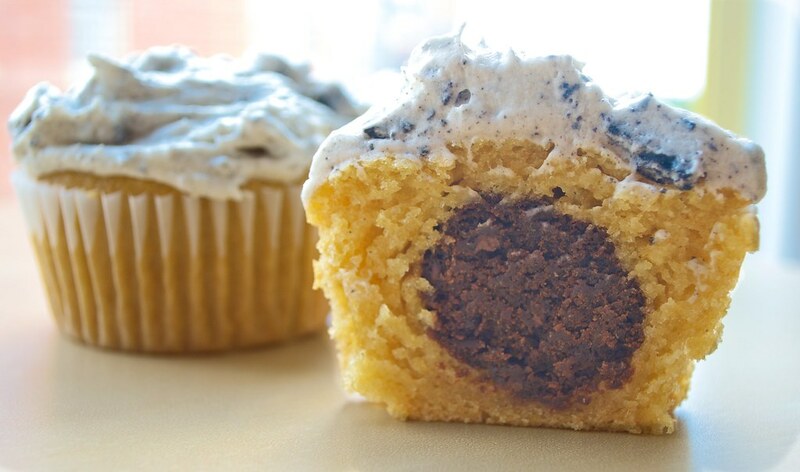 The frosting, the cupcake, the cookie dough filling, all of it, a party in the belly. Nik’s right, these are a party. Eating Eva’s cupcakes made me remember the fun of eating birthday cake at age 6.
what non dairy milk did you use? There are so many out there…soy, almond, hemp and they all have different flavors…plain, vanilla, very vanilla…And what kind of chocolate chips? Plain soy milk works great in this recipe, but I would guess that it is flexible enough and would work with almond or other types as well. Almond milk works great in baking as well. The flavored vanilla milks will make the cupcakes a little sweeter, but it is a small quantity of milk, so it probably won’t change things very much. For chocolate chips, look for any standard-size semisweet variety that doesn’t contain milk. Or, try mini chips for a different texture.